The launch of the new Reese’s Outrageous® candy bar, which was near impossible for consumers to get their hands on as it quickly sold out, inspired a new DQ® Blizzard® Treat which is now available at participating Dairy Queen® and DQ Grill & Chill® locations nationwide. The new Reese’s Outrageous Blizzard Treat is a decadent combination of Reese’s Peanut Butter Cups®, crunchy Reese’s Pieces®, creamy peanut butter topping, and a layer of warm and sweet caramel topping hand-blended with signature DQ® vanilla soft serve. DQ is the first and only QSR partner of Reese’s Outrageous, and knows fans will run to get their hands on this outrageous soft serve creation. In addition to the Reese’s Outrageous Blizzard Treat, fans can still enjoy the Summer Blizzard Treat Menu with two fan-favorite Blizzard Treats, Cotton Candy and S’mores, and three new Blizzard Treats, Jurassic Chomp with peanut butter, Summer Berry Cheesecake, and TWIX®. 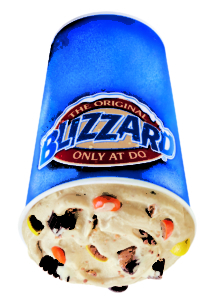 Blizzard Treats are made to order and are offered in four sizes, including the popular Mini. An added bonus for fans, those who download the DQ app will receive an offer for a free small Blizzard Treat deal, after download and registration. National weekly exclusive DQ deals on treats, food and beverages, redeemable at participating DQ restaurants in the U.S., excluding Texas, and Canada, also are available on the app. For more information about the Dairy Queen system, visit DairyQueen.com. Connect with the DQ system on social media with #LOVEmyDQ.